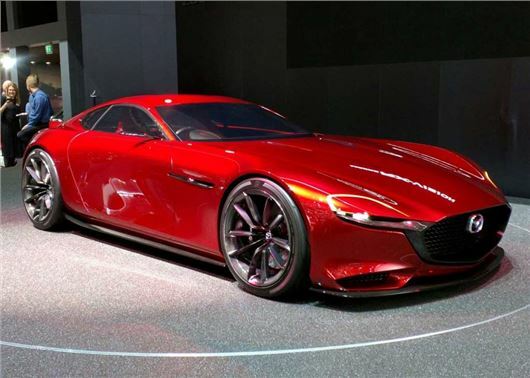 Mazda has wowed Geneva with the RX-Vision. The two-door, two seater sports car previews the technology that will be used in the next-gen RX-8. Sadly there are no plans to launch the RX-Vision as a standalone model. Mazda calls it "a symbol of its rotary sports car legacy," in a shameless attempt to coerce automotive publications into claiming it a "precursor to the next RX-8" or similar. The next RX-8, if there is one, will look nothing like this. Yet the RX-Vision is exactly the sort of fantasy that motor shows are for. It’s already won a 'most pretty concept car' award in France. True to the remit, this two-seat coupé has a rotary engine, which if nothing else suggests that Mazda is set to press on woth the oil-guzzling technology in future. In size terms the RX-Vision is about the same as a Jaguar F-Type, though its far more dramatic proportions make it appear considerably longer and lower.